Country: Trinidad-Tobago | Beer Apprentice - Craft Beer News, Reviews, Interviews and Info. For today’s craft beer review I’m going to be sampling the Carib Premium Lager produced by Carib Brewery Limited located in Champs Fleur, Trinidad & Tobago. I can’t say that I’ve ever had a brew from Trinidad & Tobago, so this could turn out to be a very interesting experience. 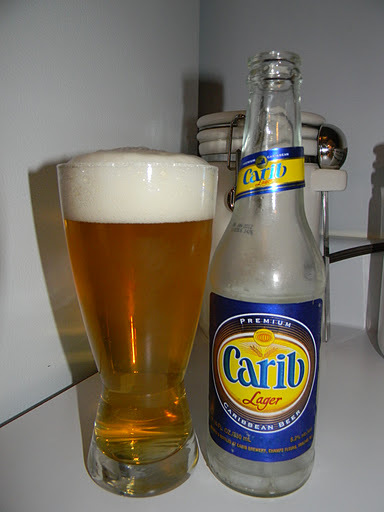 On the website, caribbeer.com, I found this description of the Carib Premium Lager. What makes Carib Lager the favorite brew of Trinidad and Tobago (not to mention honorary islanders worldwide)? We start with pure, crystal-clear water drawn from ancient island aquifers. Then we craft the perfect blend of malted barley – a recipe with a bit of colonial British ancestry, informed by generations of island tradition. For the finishing touch, we ferment longer, at colder temperatures. The result is a distinctively clean, satisfyingly light, refreshingly crisp lager. The independent – the outsider – the instigator – will taste freedom in every refreshing draught. Well, let’s see how it is. This brew comes in an 11.16 oz., clear (ugh!!!) bottle and it has an ABV of 5.2%. It poured a very clear, straw yellow color. The head was bright white, soft, fluffy and of decent size. It kind of had a soapy texture and appearance also. The retention time was average and the lacing was only “so-so”. The aroma brought forth some toasted grain intermingled with corn husk and white bread. Maybe the most faint lemon sweetness in there too. It had some unpleasantness of skunkiness. It also smelled kind of musty. Additional hints of cardboard and plastic. Man, this thing did not smell very well at all. The taste revealed a distinct graininess as well as some distinct bready malts. Flavors of corn adjuncts. Like the aroma, very light hints of lemon citrus. It tasted a bit stale and stagnant to tell the truth. Other than that, not a lot going on here. Definitely not the greatest tasting beer that I’ve ever had. The mouthfeel was medium/thin to mostly thin bodied. It was dryer than I had anticipated though. I found it to be rather smooth, crisp, refreshing and thirst quenching. Little to no flavor was left on the palate after each swig however. That was quite alright though because I really didn’t find much to get excited about in regards to the aftertaste. Hmm. This beer was a little hard for me to drink. I was able to finish it, but I didn’t find myself craving another bottle that’s for sure. There wasn’t a whole lot to this beer and what was found wasn’t the most pleasing. It is a little better than the “Big 3”, but not by much. I’m sure this would be an ok “lawnmower” beer, however that would probably be the only time I would really be able to enjoy it. Don’t go out of your way to find this brew. If it’s offered to you… try it and see what you think. You may very well like it and find it enjoyable, but for my money, I may look elsewhere.